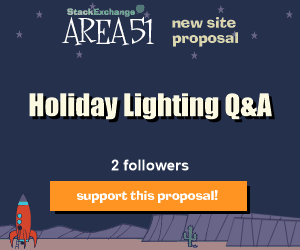 Decided to spin up a proposal for a new Stack Exchange for holiday lighting! As a fan of other SE sites (like StackOverflow), I thought this would be a neat way to provide a place for other holiday lighting enthusiasts to ask questions and vote on best answers. This would also give everyone and easy way to search and source commonly asked questions. Here is a link to the exchange where you can start asking and answering questions! Be sure to follow it so it can work it's way to the next phase! So the first small hurdle here is getting past the initial proposal requirements. I’ve provided 5 sample questions already, but I’m needing 5 people to help by following the proposal. Would be great to get some experts in there who can help answer questions that come up. Otherwise it won’t be very helpful. I can't speak for anyone but me and I have no idea what stack exchange is, but I can tell you is that there are more places to post and get answers these days than I ever believed would be possible when I did my first animated lighting show 12 yrs ago. I am burned out on way to many places as it is. Before you give up, let me state and ask ...I don't know "Stack Exchange". I'm sure I am not alone on this. What benefit would it bring to the DIYC crowd? How would you use it? How would anyone use it?We are definitely inundated with information in many forms and way too many places at this time. This is just the nature of open systems. They don't call it a "web" for nothing.Then again, this is DIYC. We have been and are a very versatile group. We have simple users all the way to extreme designers - both hardware and software. Perhaps your idea would be just what a segment of this community would use. Perhaps there are those out here that don't know that they need what you are offering. It probably won't be in an area that I or anyone else who has turned down the offer here would use, but there are literally thousands on these boards and this idea may find a home. You just need to let us know what, how, where, and why. Try to flesh out the advantages that you see and convey them to the rest of us.